The field of radiologic technology is a growing one. More and more jobs open up in this area of healthcare every year and in very state, including Nebraska. With a growing and aging population, healthcare is one area of the economy that is not slowing down. Careers in radiologic technology are expected to grow at 12 percent over the next several years, which is twice as fast as other jobs. Currently, around 1,530 people work in radiologic technology in Nebraska. Because the population of the state is sparse, getting a position here is easier than in other states. Across the country, the average annual salary for a radiologic technologist is $60,320. The average hourly salary is $29. The earnings are a little lower in Nebraska compared to the national average, but the cost of living in the state is also lower than average. Radiographers in Nebraska can earn on average $52,210 per year or $25.10 per hour. With training in special areas of radiology or with years of experience, annual salaries in the state can go up to $60,000 to $70,000. More information on Rad Tech salaries in Nebraska. Radiologic technologists in Nebraska must be certified by the American Registry of Radiologic Technicians (ARRT), which involves passing the organization’s examination. They must also be licensed by the state through the Department of Health and Human Services. In order to be licensed, a technologist must complete a course of study at a college or university, pass the AART exam, and then apply for the state license. Once licensed, a technician must continue with education by taking 24 credit hours every two years. The state also provides certification for limited radiographers. The University of Nebraska’s Medical Center is the largest radiologic technology program in the state and helps students work towards a four-year degree. Clarkson College offers both four- and two-year degrees in radiological technology and Chadron College has a unique program for rural students. University of Nebraska. UN’s Medical Center in Omaha offers a Bachelor of Science degree in radiation science technology. 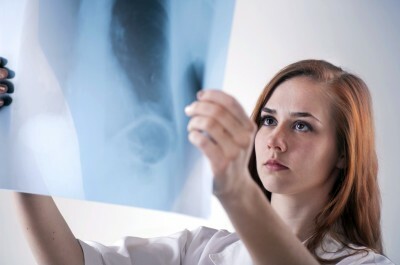 Students admitted to this program can choose from specialties in radiography, nuclear medicine technology, radiation therapy, diagnostic medical sonography, computed tomography/magnetic resonance imaging, or vascular interventional technology. The program also includes intensive internship experiences. Clarkson College. Also in Omaha, Clarkson gives students the choice of earning an associate or a bachelor degree. With the associate program completed, students may become certified and licensed to work as radiology technologist. To continue further, students may choose to earn a bachelor degree in medical imaging. With this option, students can earn both an associate and a bachelor degree at the same time. Chadron State College. Chadron in collaboration with the University of Nebraska Medical Center offers education in radiology for rural students. To be admitted to the program, students must be from a rural part of the state and they agree to return to a rural area to work after graduation and certification. In addition to the four-year programs for radiological science, several community colleges in Nebraska offer associate degrees. Northeast and Southeast Community Colleges. Northeast is located in Norfolk and has a radiologic technology program in cooperation with Southeast Community College. General education courses are completed at Northeast, while radiology courses are taken online through Southeast College. Students gain clinical experience on-site at Faith Regional Health Services in Norfolk. Students of Southeast can take all courses online or on campus and get clinical experience at any number of local hospitals and clinics. Midlands Technical College. Midlands offers an associate degree in radiologic science with specializations that include computerized tomography, ultrasound, nuclear medicine, radiation oncology, and more. Nebraska Methodist College. Nebraska Methodist offers a two-year degree in radiologic science. The program includes general education courses, radiology courses, and clinical experience. The largest employers of radiologic technologists in Nebraska are in the larger cities, but there are options in rural areas as well. The main professional organization in Nebraska for practitioners of radiologic technology is the Nebraska Society of Radiologic Technologists. This is the state’s affiliate of the national organization the American Society of Radiologic Technologists. Certification examinations in Nebraska are administered through the American Registry of Radiologic Technologists and licensing applications go through the state’s Department of Health and Human Services. Any of these organizations can be contacted for more information about certification, licensing, and education. The Joint Review Committee on Education in Radiologic Technology, in particular, has good information about education.